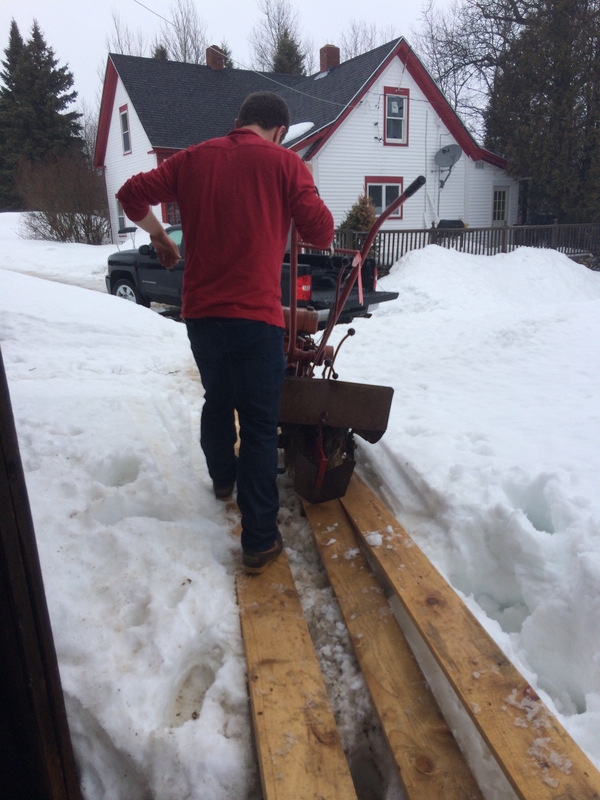 Home/DIY, Stories/Are snowshoes a sign of Spring? Spring is here—at least, it’s here in Portland, Maine. Daffodils are blooming and it’s an unseasonably warm 70 degrees—a sure sign our state is thawing out. Five hours north however in Aroostook County, spring hasn’t exactly sprung. Snow is still in the forecast and GROMAINE Farm is under a blanket of white. Prepared for a harsh winter, my brother Jon and I built a high tunnel—a greenhouse that uses the earth as its floor. With a double layer of inflated plastic, we were able to keep snow off the roof (a “fun” challenge this past winter) but the good news is, the ground is ready for planting. 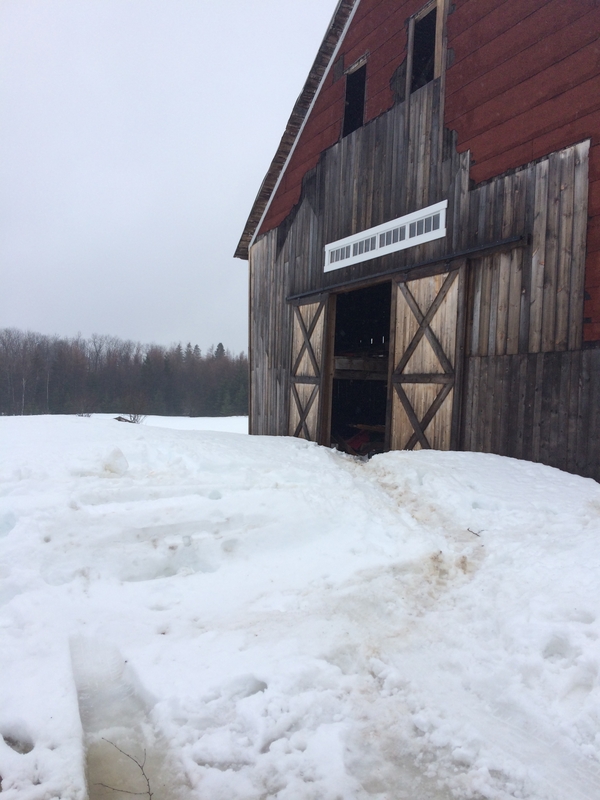 So, as we stood inside the high tunnel the other day, we nodded in agreement that there was just one small obstacle left: getting our equipment from the barn to the tunnel—more specifically, through four feet of snow. 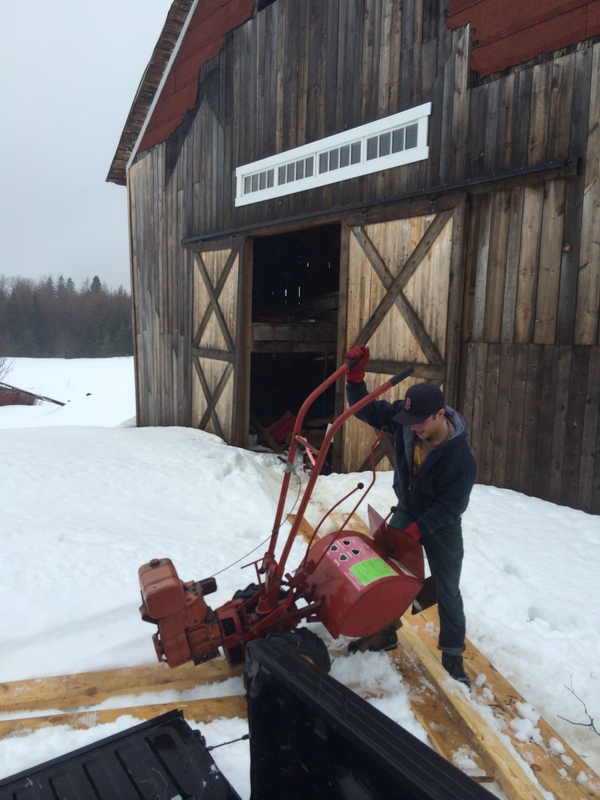 We used wooden planks to help prevent the rototiller from sinking into the snowy depths. That is a pretty solid lean. Strapped in our snowshoes, Jon and I scouted out the path of least resistance. The footwear wasn’t for dramatic effect—we’d have sunk chest-deep as temps finally crept past freezing. 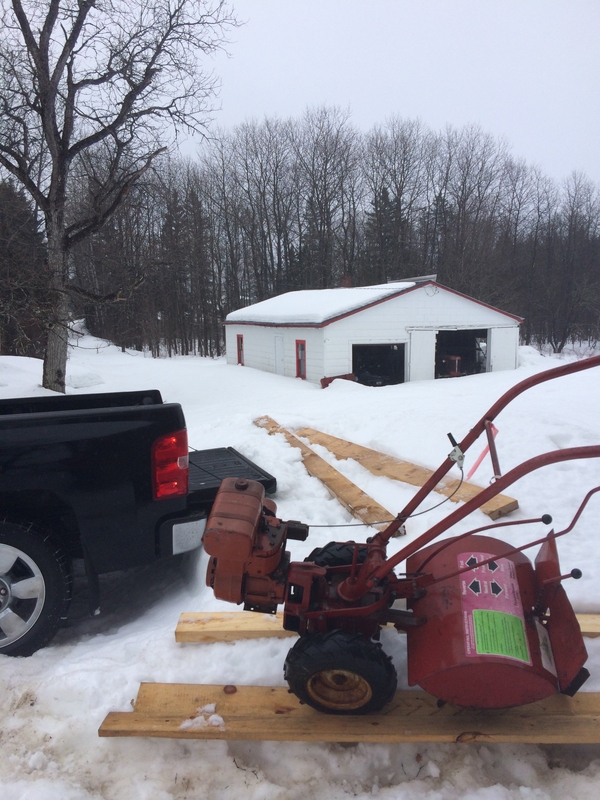 Several hours, 6 planks of wood, and a pickup truck later, phase 1 of moving our rototiller was complete. 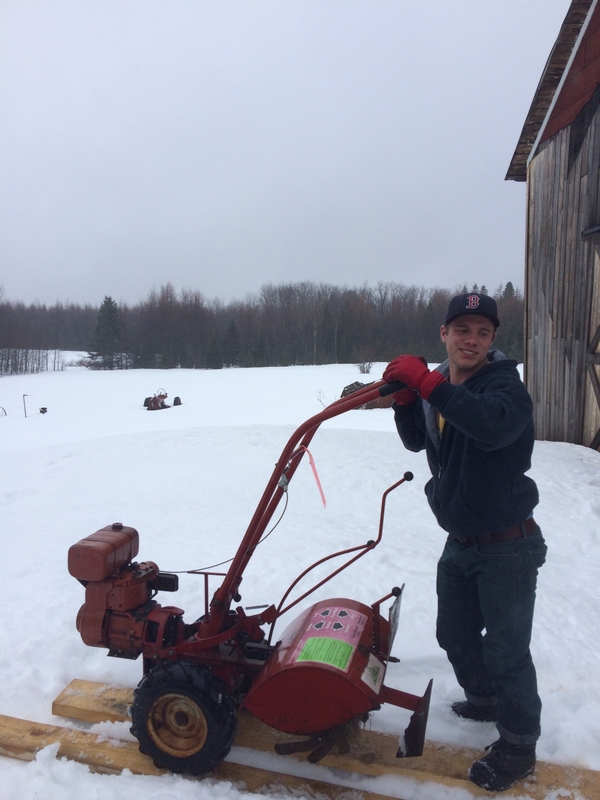 The rototiller is “leaning toward sawyers” (Maine colloquialism). There are a lot of sounds people associate with spring—a baseball game, birds chirping, the absence of snow shovels hitting the pavement. 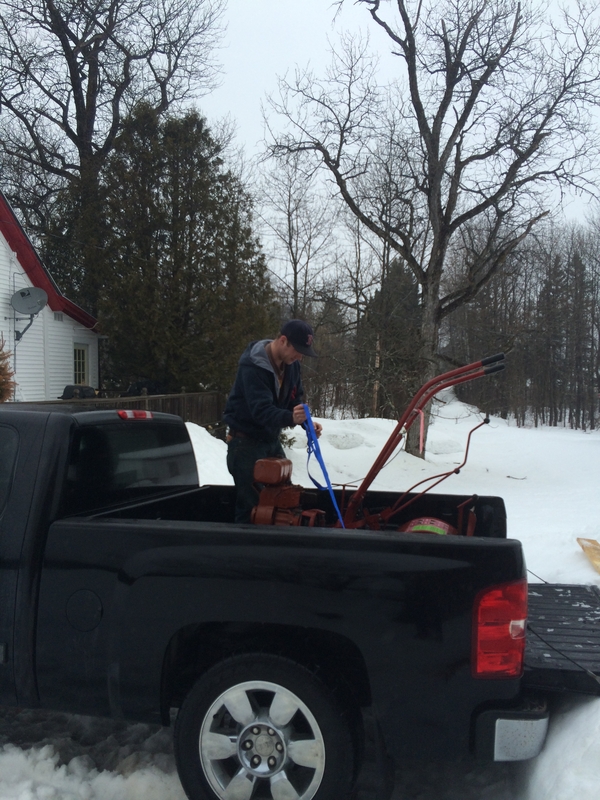 But for my brother Jon and I, the sound of spring came in the form of congratulatory high-fives as we reached our pickup with our rototiller. 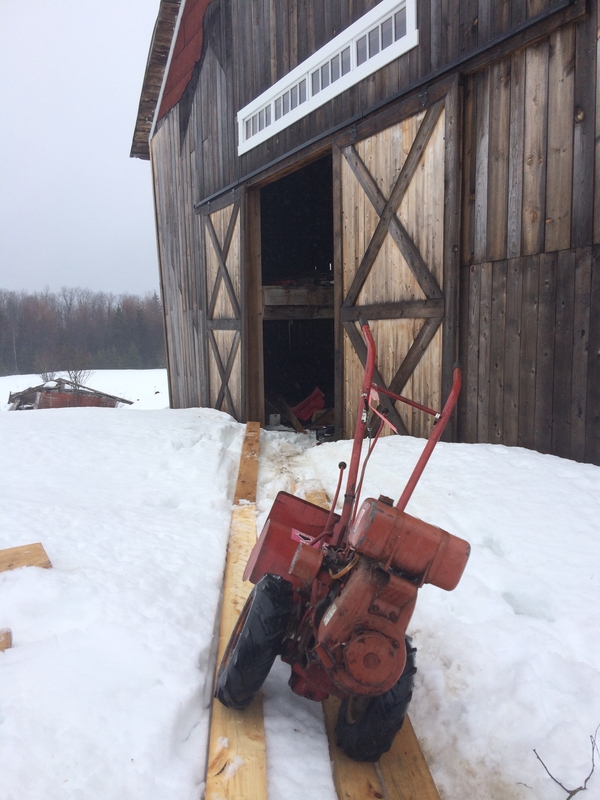 After a quick tune-up, all that was left was to somehow get the tiller to the high tunnel over a long stretch of snow. Thankfully (and I can’t believe I’m saying that) we had a cold, low teen temperature night and the next morning we were able to walk the tiller right on top of the crust. Here is 6 seconds of the trip. 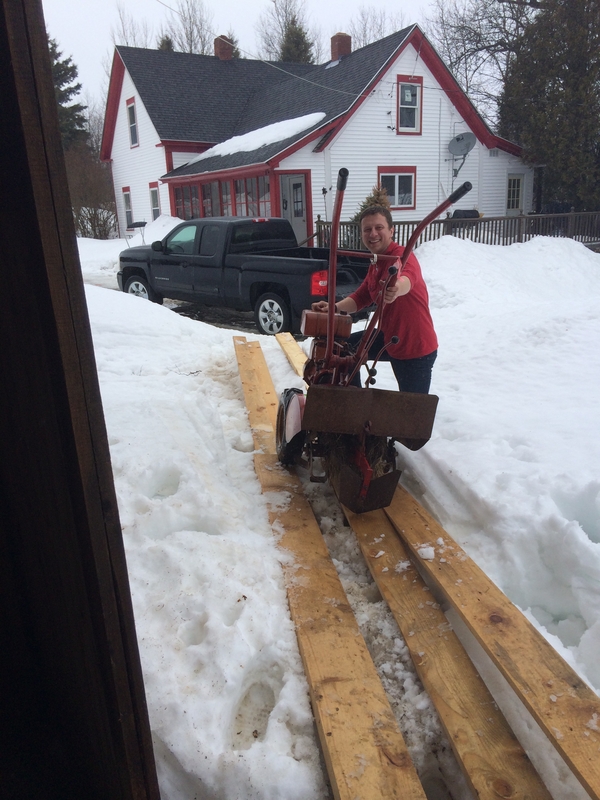 Sorry about the quality; as it turns out it’s not as easy as you’d think to steer a rototiller over several feet of snow while taking video on your phone. Jon reports that the high tunnel reached temperatures of over 100 degrees two days ago. Be on the lookout for posts regarding planting coming your way very soon! 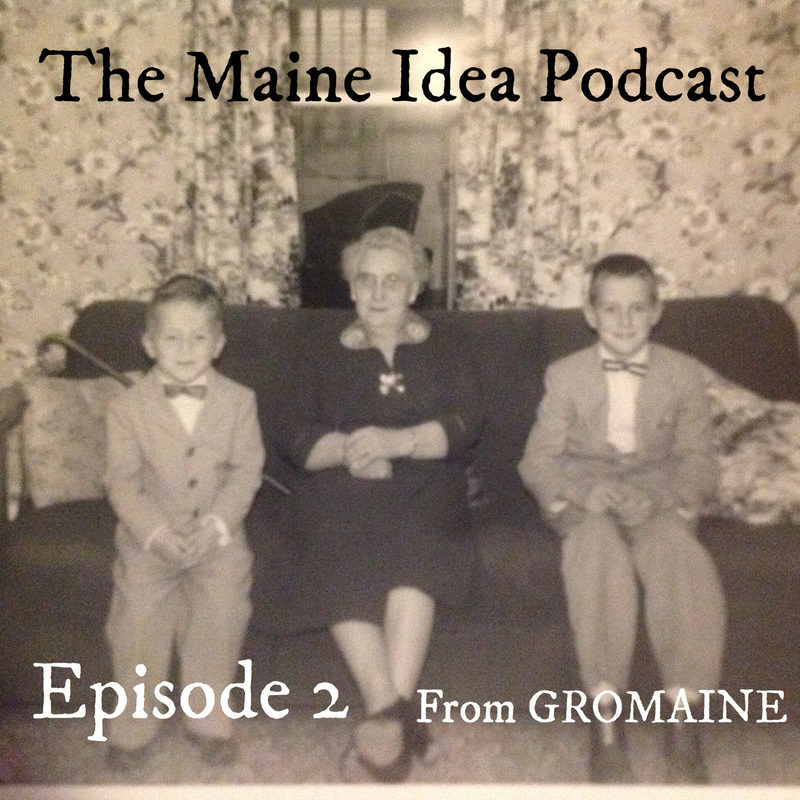 So from all of us at GROMAINE, happy (belated) spring. For more on the Maine colloquialism “leaning toward sawyers”, check out this link to “The Deep Woods Origins of Down East Expressions”. Can’t wait to show these to uncle Kevin tonight. He will say you are making your great grandfather proud ! Good luck with your farm. We hope to get up that way when we do the Allagash or camp at Baxter. This fall.